As we come to this Christmas Season, we are reminded once again that this is a season of Hope. It is a season that reminds us, that no matter where we find ourselves or what may be happening around us, God is with us. God is there to lead us and guide us through the realities of our everyday lives. It is easy for us to become discouraged in the face of so many challenges in our world. But God is available to heal us and restore us in ways we couldn’t possibly imagine. God’s plan is infinitely greater that any plan the world wants to construct. In this time when the world is shouting fear, hate, anger, and distrust, we are invited to listen for a more gentle voice, the voice of hope and joy and trust and love in the Baby Jesus. Let this be the voice that surrounds us in all that we do, in all that we are, and in all that we strive to be this Christmas Season. Let us join with all Christians throughout the world and show that living in Christ’s love is the true joy in this Christmas Season and at all time. I pray you, your families and friends have a Merry Christmas and a Joyful and blessed New Year! May the ‘holy Child of Bethlehem’ come to and abide with each of you this Christmas and through the coming year 2018. By the grace and with the help of God may we be peacemakers in our troubled world. and a Christmas message from Bishop Robert. Join us to celebrate the incarnation of our Lord Jesus Christ with carols, lessons and a service of Holy Communion. Lessons & Carols thanks – Thank you to all those who helped make our service of Lessons & Carols a wonderful event. Amongst others: Archdeacon Colin for joining us to lead the service, Stephen our organist, Valdis Bizun our trumpeter, Anja, Anna,Joe and Drew – our choir, Naomi for feeding the musicians and singers, all those who read, Bernd our crucifer, Jackie, Rainer, Darren and the hospitality team, Roger and his team of sides-people, Gary and helpers for the logistics, the Messner from the Leonhardskirche and all those others who stepped in to help unnoticed without who things wouldn’t have run smoothly. Thank you. 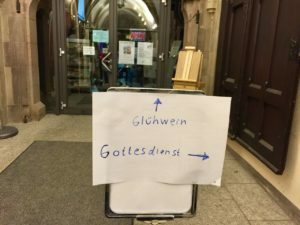 Der Lessons and Carols Gottesdienst in Ulm ist leider vorbei. Er war sehr schön und gut besucht. Das anschließende Zusammensein haben alle sehr genossen. PS: Am Ausgang entdeckten wir dieses Schild. Organ news – intermediate repairs have been made to the organ and it is now playable again. More work will need to be carried out in the new year, but our thanks go to the Old Catholics for ensuring that we have music at Christmas. This entry was posted in Message from our Bishop, Notices. Bookmark the permalink.